A week ago I tweeted about the movement to have Pat Burns inducted into the Hockey Hall of Fame. I had wanted to expand on that 140-character missive, but the Easter holidays got in the way. However, now I’ve got the chance. As TSN later reported, the Facebook group Let's Get Pat Burns into the Hockey Hall of Fame - NOW! has the support of tens of thousands of hockey fans - over 49,000 as I write this – to put the former National Hockey League coach into the Hall of Fame before he succumbs to terminal cancer. Other media outlets have picked up on the page, including Hockey Night in Canada, Coast to Coast with Don Cherry, the Montreal Gazette, the Toronto Sun, the Toronto Star and several radio stations. Burns has a wealth of accomplishments that should earn him a spot in the Hall of Fame. In his 14 straight seasons as a head coach he won 501 games with four teams, making it to the playoffs 11 times, the final twice and winning the Stanley Cup once. To put that in a historical perspective, Burns is 11th in NHL history for number of games coached, nine behind Brian Sutter. Burns is also 11th on the list for coaching wins, just one behind Hall of Fame member Glen Sather. Even his losses stack up well, with Burns dropping 353 decisions in regulation and 14 in overtime (OTL was only counted in his last four seasons). That’s significantly less than Jacques Demers (468) and Brian Sutter (437), both of whom also coached for 14 years. Granted, Burns doesn’t come anywhere close to the top 10 in terms of Stanley Cup wins, but he does at least have that one Stanley Cup ring from the 2002-03 New Jersey Devil’s championship, which is better than many other members of the Hall of Fame. One could speculate that had it not been for Burns’ premature retirement, he’d have moved even further up these lists. Certainly, he could have moved up on the lists for games coached, and presumably climbed further up in terms of wins. However, the Hall of Fame shouldn’t rely upon conjecture or presumptions. The man’s record speaks for itself. Even within the constraints of his shortened career he put together an exceptional coaching record. The only question is whether or not Burns will be alive by the time he is inducted into the Hall of Fame. Burns was present at the groundbreaking ceremony of a hockey arena that will be named in his honour two weeks ago. During the press conference, Burns was not optimistic about his chances of seeing the rink completed. "I probably won't see the project to the end," said Burns. "But let's hope I'm looking down on it and see a young Wayne Gretzky or Mario Lemieux." Normally, there is a three-year waiting period after retirement to gain admission to the Hockey Hall of Fame. However, there is precedent for the Hockey Hall of Fame speeding the process up: Roger Neilson was fast-tracked as he was terminally ill, as was Mario Lemieux, whose Hodgkin's lymphoma appeared to be fatal. Burns has everything going for him. He has a high-calibre resume, the support of many hockey insiders and the Hall of Fame has done this kind of promotion before. All that’s left is for the selection committee to take note of his accomplishments and the groundswell of support for his induction. It would be a fitting cap to a stellar career and an inspiring life. 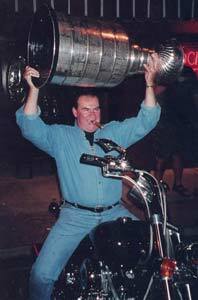 If you’d like to throw your support behind the Let's Get Pat Burns into the Hockey Hall of Fame - NOW! Facebook group, you can join by clicking on this link. Three years ago, as a lark, I challenged my friends, family and co-workers to try and read as many books as they could in a calendar year. The idea was to encourage reading more and better books and broaden literary horizons. Reading for work or for school doesn’t count. Books shouldn’t be assigned, but chosen for fun. Any book counts, as long as it’s for ages 9-12 or up. This designation was to allow for the Harry Potter books which fall into that age category. If you’re learning a new language books written for younger children count too. Graphic novels, plays, and poetry all count. The Book Challenge, as it came to be called, was all about setting reading goals. Most people settled on 50 books per year (a book per week with two weeks of vacation). Smaller goals were also encouraged like “10 of my 50 books will be poetry,” or something to that affect. My personal caveat is that I only count 10 graphic novels per year. Otherwise I'd only read comics. It’s been a pretty big success, with monthly reads discussed on our Facebook group. (Please, feel free to join!) Most people take it on as a New Year’s Resolution, but we have people coming and going all the time. In part, the Book Challenge is popular because, unlike a book club, the reading isn’t assigned and you can move at your own pace. Also, it’s reassuring to see other avid readers apologize for not being able to read books for months at a time. Last year I completed just 29 books, a disappointment since I’d planned on doing a full 50. But now that I’m done school I feel that I can definitely reach that golden mark.